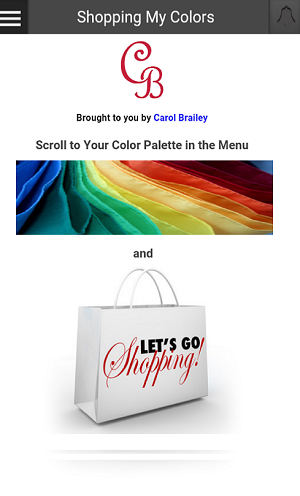 This App is the perfect shopping companion for those who want to shop with their seasonal colour palette on their phone and/or those who want to explore the world of colour analysis and use colour analysis while shopping. The app is compatible with Android (v4.4.2 devices and up) and Apple devices (iOS 8 and up). NEW! You can now use the app on your computer or phone through our app’s website or preview the app before downloading on our app’s website. Sample colour references, sample looks, hair colour and makeup colour recommendations for each seasonal colour palette. Steps to choose your best hair and makeup colours. Options on how to find out your best colours both offline and online, including do-it-yourself videos. Links to videos and blogs on colour analysis. Sample looks in the App are updated frequently from our Pinterest Boards. Carol Brailey hopes this App inspires you to wear your authenticity!